My Bloody Valentine are a shoegaze band formed in late 1983 in Dublin, Ireland. The band’s best known lineup is Kevin Shields (vocals, guitar), Bilinda Butcher (vocals, guitar), Debbie Googe (bass) and Colm O’Ciosoig (drums). Their 1988 album "Isn't Anything" is generally regarded as one of the most influential records of the period, acting as an important precursor to the early 90s 'shoegazing' scene. In 1991, the band released their second full length album “Loveless”, later declared one of the finest albums of the 1990s. The band struggled to record a follow up album and split in 1997. The band reunited in 2007 and performed several concerts the following year. The band’s key member is guitarist/singer/composer Kevin Shields, a reclusive perfectionist and radically inventive guitarist/engineer. The band’s other original member is drummer/studio maven Colm O’Ciosoig; during their heyday MBV also included singer-guitarist Bilinda Butcher and bassist Debbie Googe. Their band shares its name with a low-budget Canadian slasher film. MBV influences include The Velvet Underground, Sonic Youth, Cocteau Twins, late-1970s Wire, The Jesus and Mary Chain, and independent artists such as the Pastels. Kevin Shields has also named The Beach Boys as a personal influence. After leaving Creation Records in 1992 and signing with Island Records, the band fell into a creative black hole. Rumors spread among their fans of albums being recorded and then shelved. Debbie Googe left the band to form Snowpony; she had not played bass on their recordings since You Made Me Realise. Colm O’Ciosoig eventually left and formed a band with Hope Sandoval, formerly of Mazzy Star, called Hope Sandoval & The Warm Inventions. Kevin Shields sporadically collaborated with other artists, most notably Experimental Audio Research, Curve, and Primal Scream. He revealed in a fall 2003 National Public Radio interview that Island Records quit financing his My Bloody Valentine endeavors after he spent half a million pounds of their money. As of 2006, many rumors mentioned the possible reformation of MBV for a new studio album, but none of these were true. On November 15 2007, My Bloody Valentine announced three upcoming live gigs in the UK for 2008. On June 13 and 14, the band played in public for the first time in thirteen years, offering a pair of ‘Live Rehearsal’ presentations at the ICA in London and officially starting their series of comeback performances. The band went on to play a slew of festivals in Summer and Fall of 2008. 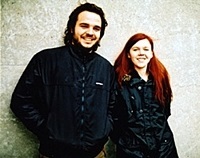 Following their appearance at the 2008 All Tomorrows Parties festival, the New York Times reported that Shields was planning to complete the unfinished album.